"They're writing about a hero that they worship. They're writing about a man that they consider to be the paragon of all virtues and they have a problem, because he was rough, and crude, and nasty, and cruel and lecherous." A&E continues their series of Mysteries of the Bible with a title that frankly seems non-mysterious. 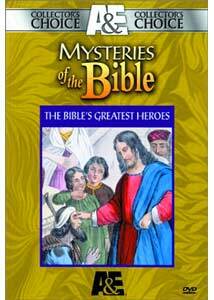 What mysteries are there about the Bible's greatest heroes? Well, the foremost, we learn here, is whether any of them ever existed at all. Starting with the biblical narratives, using classic and ancient art for illustration, the programs artfully interweave this material with interviews with theologians and archaeologists to give an appraisal of various issues surrounding the characters being considered. First is father Abraham, who is credited here as being the first monotheist. This program is quite short on mystery, although there are a some illuminating observations presented. Among these are a number of readings of the significance of circumcision, and an appreciation of Abraham's sacrifice of Isaac (or Ishmael, as the program indicates Islam thought holds). This episode does have some unusual footage to its credit, including the Kaaba and the interior of the Dome of the Rock. Of the four episodes, this is certainly the weakest in the set. More interesting is an examination of Joseph, he of the "Coat of Many Colors." Some intriguing points are passed over lightly, such as the possibility that a mummy in the Cairo Museum is in fact Joseph. The contemporary mystery of the Hyksos and their brief-lived dynasty is touched on as well. A great deal is made of the psychological relationships between Joseph and his brothers, a topic mined for literary purposes by many, most notably Thomas Mann. We do get to see plenty of Egyptian art in this installment. The producers also play a game of tantalizing, indicating that the dream of seven years of feast followed by seven years of famine has some support in that a famine of seven years can be found in roughly the right period. However, it is also pointed out that these feasts and famines were cyclical and happened all the time; indeed, a full book has been written on these famines of ancient Egypt. One of the most fascinating characters of the Bible, King David, is the subject of the third program. The 45 minutes allotted is hardly enough to contain him. Fascinatingly, there was no contemporary mention of David at all, until the recent discovery of a stone referencing "the House of David" from the century after his death. The producers point out some contradictions in the story of David, such as the fact that in two places someone else is credited with killing Goliath, indicating that the most famous story of David may be a later amendment. Ethicists and apologists take on the issue of David's horrendous conduct with regard to Bathsheba and Uriah; despite orthodoxy's defense of David as sending Uriah to death for insubordination rather than lust for his wife, the prophet Nathan's objections ring more true to human nature. A number of interesting observations are made regarding the use of shepherds as Biblical leaders. Oddest of all is the organized vandalism regularly inflicted on the tomb of Absalom. The final episode in this set concerns Jesus. Since the historical Jesus is the subject of massive tomes, the program can only address some of the issues related to the Nativity. Fundamentalists will certainly be unhappy with the less than credulous attitude given toward many of the details of the Christmas story. For instance, Bethlehem as the birthplace is not only most likely a white lie to make the facts fit the prophecies, but it was also then well known as a shrine of Adonis—a deity associated with death and resurrection himself. Furthermore, the parallels of other virgin births are noted (including Buddha, Romulus and Remus, the pharaohs, and just about everyone in Greek myth), which makes the Nativity just another mythological construct. Serious time is given to the notion of the Star of the Magi being a conjunction of Jupiter and Venus on June 17, 1 BC, which would indicate that the current celebration of Christmas is nearly as far as possible from the likely timing. Wrapping things up is the story of Dionysius Exiguus' rather random placement of the dating of the birth of Jesus, which has resulted in estimates of the date ranging from 1 to 6 BC. The program does not, however, touch on one of the most mysterious facets of the story: why Luke mentions a census that requires everyone to go to the homes of their ancestors. Not only is such a census ridiculous in a politically-agitated province, but it is completely unlike the administratively efficient Romans. Indeed, other than Luke's mention, there is no record whatsoever of such a daffy census. Those looking for a great deal of mystery and revelation here will likely be disappointed. However, the topics are given respectful and serious treatment, and the programs are chock-full of gorgeous religious art from throughout history. The four segments are narrated by Richard Kiley ("spared no expense"), with biblical passages read by Jean Simmons. Opposing viewpoints are heard, giving this a more balanced approach than one might have expected. There is plenty of interest here for anyone intrigued by the stories of the Bible. Note: The running time is nearly 20 minutes shorter than the 200 minutes listed on the keepcase. Image Transfer Review: The image is quite attractive, by and large. The interview segments and the paintings are crisp, clear and colorful. Black levels are excellent for a television program. Some of the footage of the Holy Land has a rather marginal-looking appearance. There are a couple of brief video dropouts as well. Overall, this is a better than acceptable presentation. Audio Transfer Review: The audio is quite good, but again variable depending on the source. A few of the interview segments have noticeable hiss. The narration by Kiley and Simmons is generally clear, although there are two bad moments. At one point Kiley's voice is distorted; in the Jesus episode his voice suddenly moves to the surrounds and is briefly cavernous-sounding. These defects aside, however, the audio is good enough. The surrounds are limited to music, except in the erroneous passage just mentioned. Extras Review: No extras are presented at all. Even though there is chaptering, it's really insufficient for programs of this length. A respectful, but not too credulous, examination of four Biblical characters and various issues surrounding them, including their very existence. Visually gorgeous, there is plenty of interest here.